Batista returned to cap off Monday Night RAW this week and he brought a lot of attention his way. 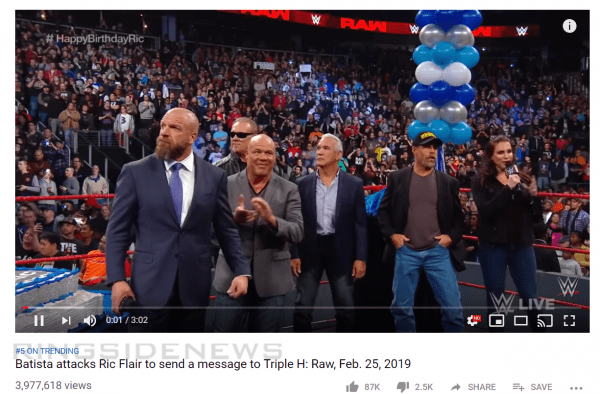 It could be the mixture of all of the pro wrestling legends in the ring or the fact that it was Ric Flair’s birthday, but the video of Batista’s attack on The Nature Boy exploded on YouTube. The video is currently sitting as the #5 trending video on the entire social media website and has racked in almost 4 million views. This is a very good sign for WWE’s social media presence. WWE tried to spice things up a month or two ago with some scandalous segments that did pretty well on YouTube. None of them brought in 3,977,618 views in 16 hours. WWE’s video for Roman Reigns’ speech and the one of his run-in to save Dean Ambrose that was actually a change of plans is doing remarkably well too with around 4 million views a piece, but neither of them are trending. It was a good night for WWE, let’s just hope the ratings agree.